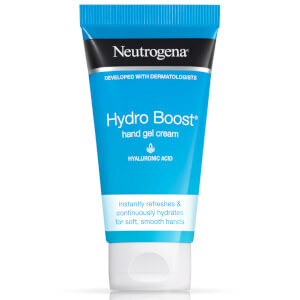 Quench thirsty skin with Neutrogena's Hydro Boost® Body Gel Cream; a lightweight, quick-absorbing formula that delivers long-lasting moisture and hydration from top to toe. Powered by Hyaluronic Acid, an ingredient capable of holding up to 1000x its weight in water, the replenishing cream leaves skin feeling soft, supple and revitalised around the clock. Penetrates quickly without greasy residue so you can get dressed immediately. Suitable for sensitive skin. Tested under dermatological control. Massage into clean, dry skin until absorbed. Aqua, Glycerin, Isopropyl Palmitate, Petrolatum, Cetyl Alcohol, DimethiconeSodium Hyaluronate, Ethylhexylglycerin,Caprylyl Glycol, Cetearyl Olivate, Sorbitan Olivate, Carbomer, Sodium Polyacrylate,Sodium Hydroxide, Tocopherol, Phenoxyethanol, Parfum, CI 42090. I have extremely dry and sensitive skin. 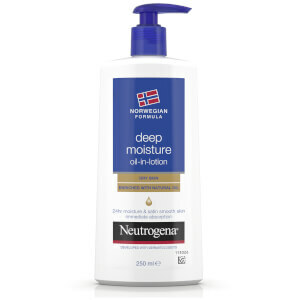 This lotion skins into my skin without a greasy feel which I like and it does not break my skin out. It keeps my skin moisturized for a good 24 hours without having to reapply. Love the feel of this body lotion. Highly recommend this product. One of the best body lotions for dry skin in the market today. Good job Neutrogena! Love this product! It smells incredible and it super hydrating on my skin. 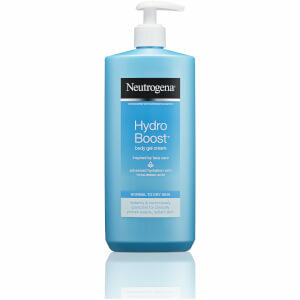 I love to use the facial version of the hydro boost moisturiser alongside this! This product smells great and leaves my skin soft and supple Applies easily with the pump and sinks in quickly - would definitely buy again!